Low Scape Mound Aronia was named 2019 Landscape Shrub of the Year in Nursery Management Magazine on April 26, 2018. 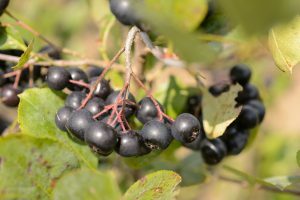 Mark Brand, a professor of horticulture in UConn’s College of Agriculture, Health, and Natural Resources, has patented two modified forms of black chokeberry that make the plant more useful for landscaping purposes. Brand has created a dense, compact form of the native North American shrub black chokeberry (Aronia melanocarpa) called UC165. UC165 has been licensed to the Proven Winners program and is sold with the trade name of Low Scape Mound black chokeberry. This modified strain is much more desirable as an ornamental landscaping shrub because it is smaller, has more abundant clusters of white flowers, edible black fruit, small glossy green leaves, and turns beautiful shades of yellow, orange, and red in autumn. These features make the new form a much more aesthetically pleasing version of the traditional plant that is also easier to manage with regard to spatial considerations. Traditional black chokeberry plants are typically four to eight feet tall and have spreading foliage. Brand’s form of the plant is much more compact, growing to only two feet tall by three feet wide, so it is more useful for ornamental purposes. With these innovations, the plant still retains its natural assets, including its ability to grow in sunlight or partial shade and in a variety of soil types, withstand cold temperatures, and require little maintenance in the landscape. Consumer demand for native ornamental shrubs has been growing in recent years, as people look to replace invasive ornamental species like the Japanese barberry or burning bush with native species that mesh better with local ecosystems. However, the market of commercially available native alternatives lacks a variety of viable options. Brand’s invention will increase the number of native shrubs that are available to landscapers. Brand has also patented another distinct strain of black chokeberry that develops a narrow upright form, called UC166. It is also part of the Proven Winners program, and is sold with the trade name of Low Scape Hedger black chokeberry. UC166 is being marketed as an alternative option to create hedges and screens instead of traditional privet shrubs, which are now known to be invasive. Low Scape Hedger grows to five feet tall by three feet wide and is very adaptable in the landscape. It also produces white spring flowers and orange fall color. Both new chokeberry cultivars are dramatically different than any chokeberries previously available for landscaping. Their unique growth forms, excellent landscape adaptability, and multi-season ornamental characteristics should make both plants favorites with the nursery industry, landscapers, and homeowners, according to Brand. The new UConn chokeberries will be available in garden centers for spring 2018. Brand has other new chokeberries in the breeding and development pipeline intended for ornamental use and also for fruit production in berry orchards. 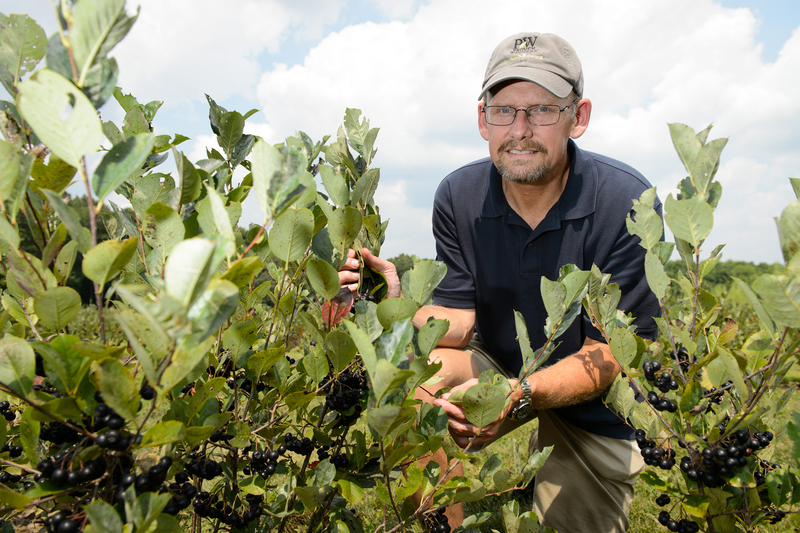 Chokeberry fruits, which are high in polyphenols, are increasingly becoming an alternative crop option for farmers. According to the Proven Winners website, Aronia’s common name, chokeberry, comes from the extremely astringent taste of the fruit. Brand received support for this project from the USDA Agricultural Research Service, grant number 58-1230-7-439. Technology Commercialization experts within UConn’s Office of the Vice President for Research provided market evaluation, patenting, and licensing support.